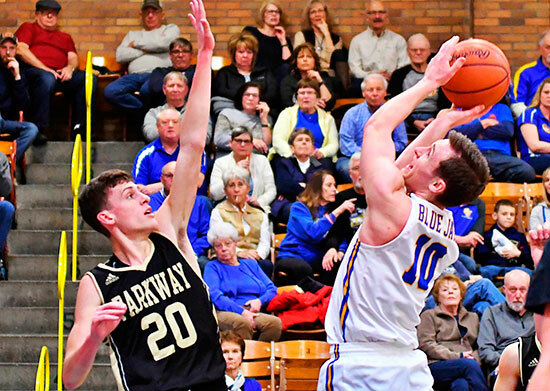 DELPHOS — It would be difficult to over-estimate the game that Delphos St. John’s 6’4 senior Jared Wurst had in the Blue Jays’ 63-54 win over Parkway Friday night. Wurst scored from all over (layups, 3-pointers, mid-range jumpers, and 6-of-6 free throws) in a 32-point night that included his 1000th career point, a free throw with 51 seconds left in the game. He also led both teams in rebounds with 13. The win left St. John’s with a 13-6 record overall, 5-2 and still in contention in the MAC. Parkway is 8-9 and 1-6. After Friday night’s games, St. Henry and Marion Local sit atop the conference at 6-1, followed by St. John’s and Minster at 5-2. St. Henry has games left with Minster and St. John’s. Marion Local will play Coldwater (4-3) and New Knoxville (0-7). The Blue Jays have Versailles (5-3) and St. Henry remaining. Minster will face St. Henry and Parkway. Delphos senior Lucas Metcalfe started the scoring with two free throws, but Parkway’s senior lefty Jack Wehe then nailed a three from the left corner to lead 3-2 at 7:07. St. John’s tied it at 5-5 a minute later when Wurst’s triple from the right wing wedged between the side of the rim and the backboard, then crawled in. A slick reverse layup by Panther sophomore Dylan Hughes got the lead back at 7-5, and the visitors led for the rest of the quarter — 18-16 after one. Wurst already had nine points — two 3-pointers and an old-style 3-point play. With Parkway up 20-18 early in the second quarter, Wurst went on his own personal 7-0 run — steal/layup, elbow jumper, triple from the left corner — to put the Blue Jays up 25-20. St. John’s would never trail again. It was 31-24 at the half, and Wurst already had 16 points. The halftime stats were pretty even. Both teams had 10 field goals, but six of the Jays’ buckets were from long range, while only two of the Panthers’ hits were from outside the arc. Delphos also hit all five of its free throw attempts while Parkway landed only 2 of 6. Wehe launched the second half with a breakaway layup to get within 31-26, but Wurst again went on a spree — a 7-3 run of his own — layup, old-style 3-point play, and a dandy eight-foot floater. In the midst of that run, Parkway junior lefty Corey Walls nailed a trey, so the Blue Jay lead was 38-29 at 4:30. Parkway junior Caleb Kinney then muscled in a layup to close the gap to 38-31, drawing Wurst’s third foul on the play. Wurst left the game and missed the last four minutes of the third quarter, but that didn’t help the Panthers. Delphos finished the quarter on a 10-4 run featuring two 3-pointers by senior Tyler Ruda — 48-35 after three. Wurst re-entered at the start of the fourth quarter and promptly buried a three from out front. With two treys from senior Mason Baxter, the feisty Panthers clawed their way back to within 58-50 with 1:04 left in the game, but there was never any real doubt about the eventual outcome. 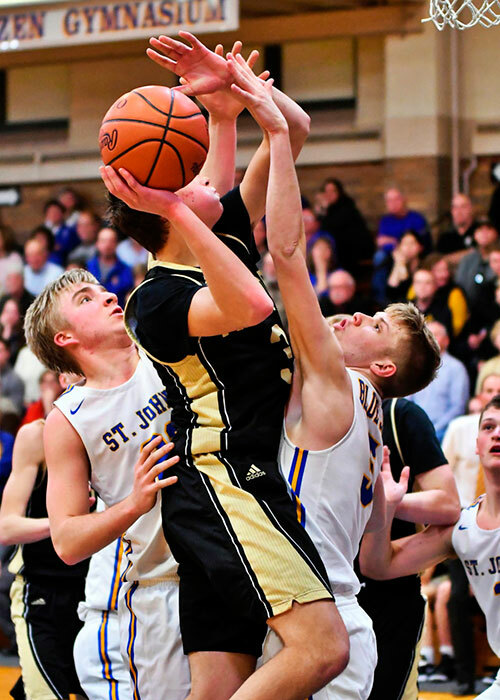 St. John’s had only two fourth-quarter field goals — Parkway had five — but the Jays went to the line 14 times, converting 10, to stay in control. Wurst had nine fourth-quarter points, including four straight free throws, the third of which was his 1000th career point, and that brought a standing ovation from all sides of the gym. For the game as a whole, Parkway was actually a bit more accurate from the field — 47 percent (23 of 49) to 44 percent (19 of 43). However, the Jays had nine triples (27 attempts, 33 percent) to the Panthers’ six (17 tries, 35 percent). Delphos also had a huge edge at the line — 16-for-20 (80 percent) to Parkway’s 2-for-7 (29 percent). The Jays won the boards 25-21. Turnovers were almost even — 10 for Parkway, 11 for St. John’s. Only five Blue Jays scored in the game, led by seniors Wurst, Metcalfe, and Ruda with 32, 12, and 12. Parkway had its usual balanced attack, led by Kinney, Baxter, and senior Preston Stober with 14, 12, and 11. Kinney led the Panthers in rebounds with 8. Dylan Hughes 5, Mason Baxter 12, Jack Wehe 7, Preston Stober 11, Caleb Kinney 14, Corey Walls 3, Caden Slusher 2. Lucas Metcalf 12, Curtis Schwinnen 6, Jared Wurst 32, Brady Parrish 0, Grant Csukker 0, Adam Fischer 0, Tyler Ruda 12, Aiden Rode 0, Griffin Hamilton 0, Isaac Fairchild 0, Brady Grothaus 1. 3-point shooting: PW 6/17 (Baxter 3, Walls, Wehe, Stober), DSJ 9/27 (Wurst 4, Ruda 4, Metcalfe). Rebounds: PW 21, DSJ 25. Fouls: PW 18, DSJ 11. Turnovers: PW 10, DSJ 11. Jayvee score: DSJ 56-47.